The great Leigh Brackett was born 100 years ago today. She put Adventure into planetary adventure the way few others did before or since, painting her settings with astonishing color and details that never detracted from the story. I’ve written about this in detail here, if you’re after a few samples of her prose and a light discussion of her technique. 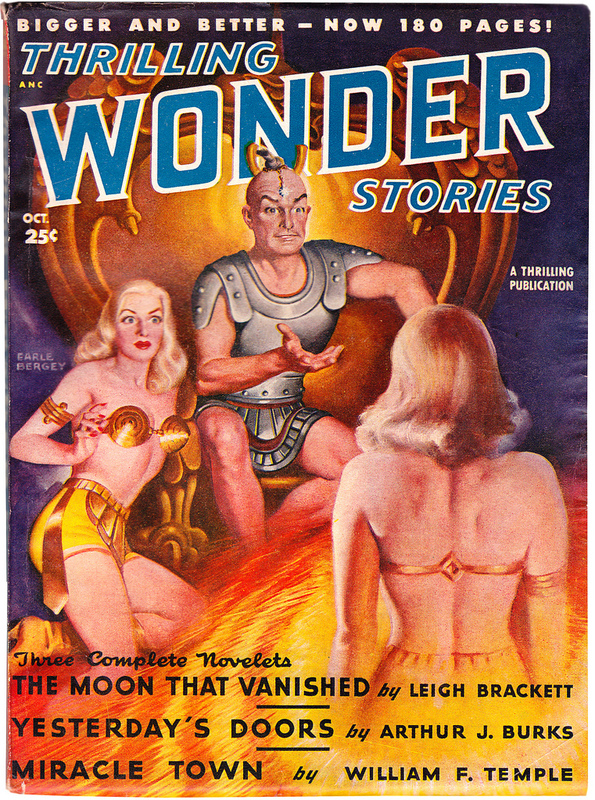 Today, though, hopefully you can join Bill Ward and me in celebrating Leigh Brackett by discussing one of her great stories, “The Moon that Vanished.” If you missed the announcement last week, you can still join in by grabbing a copy of the story inexpensively. You won’t regret it. Howard: As usual, Brackett begins with the story already underway. And, as is often the case, I find it can only add to the enjoyment of a Brackett tale if you picture Humphrey Bogart as the main character, because the story is infused with the melancholy air of a great hardboiled story. Her characters are world-weary and damaged. There is tension from the very start. Tension, and mystery. The questions about why this pathetic Heath fellow is here, and what others want with him is quickly followed by concerns about his own status as a protected pariah and what exactly that means. We learn, before long, when Heath demonstrates his power, but we don’t learn the how of his heartsickness — the means of Ethne’s death — only the implied why. A lesser writer would have slowed us down with the details at the start. Not Brackett. The missing backstory remains a hook pulling us forward. Bill: And she continues to tease out the mystery right up until the point where Heath and company actually confront their goal. As this was my first time reading this story, I’ll attest she had my interest from the start. The nature of the Moonfire, Heath’s loss, and his strange powers and status, are doled out in small, and sometimes subtle, pieces. It came slowly, sifting down like a rain of jewels through the miles of pearl-grey cloud. Cool and slow at first, then warming and spreading, turning the misty air to drops of rosy fire, opaline, glowing, low to the water, so that the little ship seemed to be drifting through the heart of a fire-opal as vast as the universe. The sea turned color, from black to indigo streaked with milky bands. Flights of the small bright dragons rose flashing from the weed-beds that lay scattered on the surface in careless patterns of purple and ochre and cinnabar and the weed itself sired with dim sentient life, lifting its tendrils to the light. Bill: I was struck by how colorful and vivid her descriptions were, but she never oversells it or gets purple. Her prose is concise, but you’d never call it barebones. Even when the pace increases to a fast clip, she’s in control. His eyes were on the woman. She was tall but not too tall, young but not too young. Her body was everything a woman’s body ought to be, of its type, which was wide-shouldered and leggy, and she had a fine free way of moving it. She wore a short tunic of undyed spider silk, which exactly matched the soft curling hair that fell down her back — a bright, true silver with little peacock glints of color in it. Her face was one that no man would forget in a hurry. It was a face shaped warmly and generously for all the womanly things — passion and laughter and tenderness. But something had happened to it. Something had given it a bitter sulky look. There was resentment in it and deep anger and hardness — and yet, with all that, it was somehow a pathetically eager face with lost and frightened eyes. Heath remembered a day when he would have liked to solve the riddle of that contradictory face. A day, long ago, before Ethne came. When I read the best of Brackett I feel like she’s taking me to school. That’s just some grand writing. Of course, she doesn’t do that with every character — that would get boring, fast. But here, with Heath’s future love interest, we see her described in a way that lets us finish the details. And note how in the end it still has mystery pulling us forward. Bill: And she’s also telling us something about Heath as she describes Alor from his perspective, only reinforcing the feeling that there are no words wasted in this story. Brackett does the same in describing the specific brand of darkness on Venus in a way that mirrors the lost and dejected Heath himself, at the start of the story: “the planet is hungry for light and will not let it go.” The same is true for the man that can’t let go of his lost love as he rots away his life in a drug den. Howard: Yes — all wonderful, subtle parallels. From the opening mystery of why Heath is interesting and what anyone would want with him we quickly move on to the mystery of what the Moonfire truly is, and the external tension of pursuit, not to mention the internal stresses of Heath and Alor falling in love even as the angry uplands barbarian looks on. There are environmental hazards, from the wonderfully named Dragon’s Throat to the monsters that lurk in the deep muck, and the clinging weeds. Bill: I really like the weed-knife on the front of the boat; details like that are what sell an exotic setting. Green-skinned dancing girls, little dragons, names like The Palace of All Possible Delights and The Ocean-That-Is-Not-Water, all work to suggest a world without the need for reams and reams of elaboration. Of course, the length of the piece is a big factor as to why this approach works so well, but I do wish some modern fantasy writers would dial back the “details-for-details’-sake” aesthetic and take a page from writers like Brackett who cut their teeth in magazine fiction. Not everyone needs to be Tolkien. Howard: She does get the setting across quickly, doesn’t she? The setting, and the atmosphere. Overlaid across it all is the fear of the Moonfire itself. Will they get there? What will happen when they do? It’s all just about perfectly paced. Nothing comes easily — everything is earned. For instance, even though Heath makes a compelling argument to Broca once he’s trying to leave, the barbarian may seem convinced, but he’s still willing to kill. Heath has to fight his way out, threatening the only thing that Broca holds dear. Bill: All of which is set up earlier in the personalities and conflict between the characters. Having the fantastical, created worlds of the Moonfire reflect the psychology of the characters, and hinging the story on that, is why the ending resonates so well. Broca is the only one looking for power, his created world an extreme version of barbarian chiefly splendor. Heath’s desire has always been love — he was willing to die alongside the mere image of his lost Ethene, his drugged stupor in the beginning of the story the flipside of whatever virtual world he could create for himself in the Moonfire. Alor is seeking the same thing, after a life of being used and possessed, but never loved. It’s only that desire that lets them reject the temptation of godhood, the realization that their own act of omnipotent creation isn’t a substitute for real love and real life. Howard: It would have been a mis-step to have another physical confrontation as the last challenge, once they finally escape the Moonfire; instead we get a fantastic social conflict, one of the most memorable scenes in the story, when Vakor and the Children of the Moon can see that the Moonfire has transformed Heath and Alor. More deeply, it’s love that transformed them, burning off the dross and making them pure. It was what allowed them to survive their terrible ordeal within the Moonfire, and at a deep level this story is all about love and its ability to bring out the best in us. Bill: And that the notion of omnipotence is perhaps an illusion — all the power in the Moonfire could not make Alor love Broca, after all; and nothing but love could make Heath reject the seductive power of absolute creation. In the end, the world Heath and Alor share in happiness is a reflection of the artificial one Heath nearly loses himself to in the Moonfire, with the profound difference that it is not a mere shadow of his desires, but a shared reality not dependent on his will. Howard: If there are any flaws here, they’re only those we impose upon a story looking back on it decades after its creation. There’s some idle hand waving about a scientific explanation of what the Moonfire is and a discussion of “radiation.” Why not? It’s really just a stand-in for an explanation that would have been given as sorcery in a modern fantasy tale. (And really, this is nothing BUT fantasy, held tenuously to the science fiction field because he’s a man from Earth and this is “Venus.”) I always find it a little jarring that Alor simply tells Heath that she loves him, and then remind myself that these are blunt people in stressful situations, and then it feels not the least bit forced. In a society of the far future we can suppose that flyers and space ships could have easily reached the location of the Moonfire and explored and explained it, but we’re not really given a sense of how sophisticated our world travelers and their instruments are, or what taboos might be in place to keep such expeditions away. Bill: I suspect Brackett could just as easily supply an explanation that it is the radiation that destroys a ship’s ability to explore the Moonfire. But really, as you say, this is fantasy adventure from the days before genre stringency and NASA data cut the legs out from under planetary romance. We hear very little about science fictional ideas here. It’s barbarians and gods and unknown powers that the story concerns itself with. Howard: I had a great time re-reading this. I’m starting to realize that my ability to read quickly has sometimes impaired my ability to truly savor. When I slow down and soak up the words I think I enjoy the text and learn more from it. I had remembered that this was a good story, but I’d forgotten most of the details. Now that I took my time with this third visit, I think many of them are stuck for good, and I look forward to re-reading more. Bill and I will be visiting Brackett’s work over the course of the next year, shortly after we finish our Conan re-read. Here’s a fine retrospective of her life and work. I’ll be linking to additional Brackett celebrations through the course of the week. Great re-read, guys. I remember being floored the first time I read this tale. Just great stuff. BTW, I tried to find some art for ya’ll, but there is nothing on the Net. How the hell has the Moonfire gone undepicted for 60+ years? I know Stephen Fabian or Whelan could’ve done it justice. Probably Maitz as well. Of course, Freas (RIP) would be the default option. Absolutely fantastic post guys. One of your best. It’s been far too long since I read Brackett. I’m making up for that this month and will be posting about some of her work on my site. I first read “The Moon That Vanished” when I was a sophomore in high school. I think I appreciate the character arcs much more now than I did then. At the time I was more concerned about the exotic setting and the adventure. While I did respond then on an emotional level, I hadn’t lived enough to truly appreciate what Brackett was doing with her characters. I’m glad to see she’s getting some bandwidth today. Let us know when your own posts go live. I’d love to hear what you have to say! The next post will be on “The Vanishing Venusians” and will go up as soon as I get today final exams graded and the post written (in that order). After that I planned to read some Mars stories along with “The Veil of Astellar”, “The Halfling”, “The Dancing Girl of Ganymede”, and whatever else strikes my fancy. Let me know what you and Bill plan to read, and I’ll choose some different titles so we don’t overlap or at least overlap too much. I think he could pull it off. He’s great with light. 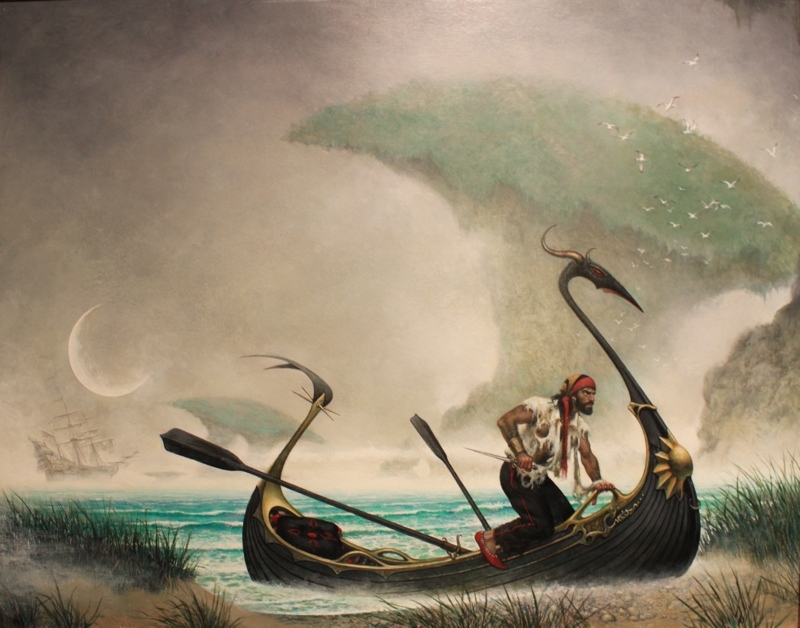 Although googling “Don Maitz Unknown Shore” brought it up. Great painting. He could definitely do the job. I reclicked and it worked. Must have been boojums in the internet. Maitz was one of th econcept artists on The Ant Bully. I got to see the movie with him and his wife Janny Wurts. I also have a signed poster of the Ant Bully. Maitz is a great guy all around as well as a superior artist. Very cool! If you ever see him again, tell ‘im Deuce has been a fan since the ’70s. Will do, but I doubt it will be any time soon. That was years ago at a new defunct convention, and I’m not making many cons these days. Great re-read, guys. There’s not enough real scholarship being pointed at Leigh Brackett these days; glad you two (and Keith!) are doing your part to rectify that. This was the first time I read the story, and a few things really struck me. One, as you already noted. Brackett is enormously gifted at saying a great deal with remarkably little. In particular, she absolutely sparkles at giving us the impression that her characters move though a world –nay, a whole galaxy — rich with myth and story. It reminded me a little of the magic of watching STAR WARS that first time… of being dropped into an utterly alien and enormously compelling universe absolutely crammed to bursting with fabulous characters, visual splendor, and ancient mysteries. DAMN. See what I mean? This is a world where there’s danger and mystery around every corner. There is literally no point at which I felt that the characters, if they’d taken a sudden left turn, and maybe climbed out of their boat for a brief picnic, would not have experienced peril and adventure. How does she do it? When they finally enter the quiet, weed-choked waters of The Upper Seas, I thought, “Okay. I can take a breath here. Our heroes are out of danger for a few heartbeats.” And then there’s this in the VERY NEXT PARAGRAPH. “There was life under the weed, spawning in the hot stagnant waters, multiform and formless, swarming, endlessly hungry… here and there a flat dark head would break through with a snap and a crunch. and it would watch the Ethne with incurious eyes while it chewed ans]d swallowed. Seriously. HOW DOES SHE DO IT? But the thing that stayed with me when I closed the book is that aspect of her writing that Howard pointed out straight off… how she pulls you forward with mystery. Every few pages, her stories throw of sparks that ignite new questions. She hooks you fast and hard. Did Ethne commit suicide? Did she drown? More Brackett mystery. If anyone has insight on this, I’m dying to hear it. Oh — and Howard, I completely agree. Within two pages, I was picturing Heath as Humphrey Bogart! The Sea of Morning Opals was the sea they sailed on to get to the Moonfire, unless I’m mistaken. I had assumed Ethne died on the voyage there — that may, in fact, be the only reason Heath turned back and didn’t go further into the Moonfire the first time. It’s certainly never made explicit as you say. Was there a time discrepancy between her death and mention of the first expedition? I’d have to go back and look. Even if Heath wasn’t in the ‘opium den’ for years, it’s not like he’d have to go there immediately after the expedition. In fact, his awareness of his pariah status sort of implies he at least tried to exist in the world for some time afterwards, finally just washing up there. Maybe we’ll get to the bottom of it in our 2033 re-reread! Bill — yeah, that’s an excellent point. Brackett makes it clear this is the beginning of his fourth season in the ‘opium den,’ but you’re absolutely right that he probably didn’t end up there immediately. I didn’t consider that. This is why your name is in lights on these re-reads! Oh, and on the topic of art, I’m surprised no one has mentioned Earle Bergey’s cover to the October 1948 Thrilling Wonder Stories, in which “The Moon That Vanished” first appeared. It depicts the scene in which Broca, on his throne, conjures up the illusory version of Alor, while Alor watches at his side. Also, I really love some of these gravatar avatars you guys got randomly assigned, poor Howard is frazzled, Deuce has been forbidden to speak because of his unibrow, and, strangest of all, John looks just like his real life self! Are you guys planning to review anything else by her–like Sword of Rhiannon or the Skaith series? We probably will. We haven’t decided which ones yet. I’d originally been planning on “Sword of Rhiannon” which is one of my all-time favorite stories, but my friend and REH scholar Deuce Richardson pointed out that there have been a lot of reviews of that one already. With Spring right around the corner Bill and I should probably start revisiting what we’ll read and when we’ll start our re-reads.